Before we dive into last night’s Glee, we need to talk about Yeast-I-Stat. Santana’s commercial for yeast infection medication was a spot-on parody (and Naya Rivera looks surprisingly persuasive in her infomercial-approved polo shirt), but even better: It wasn’t the only great thing about last night’s episode. There was character growth, there were actual jokes, and there were songs that were actually relevant to the situations in which they were being sung. Wonders never cease. Rachel’s down on her luck after Santana books the Yeast-I-Stat gig, making her the first one to get legitimate, paying work as an actor. Rachel sulks around a bit, grumpily tuning pianos at NYADA, until Kurt shows up for a pep talk and a duet of “Get Back” sung on rolling, spinning pianos. It’s great to see Kurt have a performance like this in two consecutive episodes, given how underused he was for the bulk of last year, and Rachel’s juju must’ve turned around, because it turns out she’s going to play Fanny Brice in Funny Girl after all. This should be fun! I’m not being sarcastic — I actually think the scaffolding around a full-scale Broadway revival will create some really interesting storytelling options for Rachel and the rest of the New York cast. Back at McKinley, it’s prom time! Sue’s decided to lump the junior and senior proms together and announces nominees for king and queen. Tina’s nominated, and she is thrilled. She launches into “Revolution,” only to have the entire glee club walk out when the bell rings 30 seconds into it. Tina’s story line has bothered me for a while now, especially when it comes to gags like that. It’s clear that she’s a character who believes that if you work hard and wait patiently, you’ll get the things you want, whether that’s a solo, a boyfriend, or a crown. More than any other character, she’s had to grapple with the idea that you can’t always get what you want, and because of that, the Schadenfreude with which Glee has treated her more recently is a little off-putting. Bree, the mean Cheerio whose sole purpose is to be mean (she has a conversation with Sue at the end of the episode where Sue all but refers to her as a convenient plot device), decides that a Cheerio needs to be prom queen for a change. Granted, she has a point, since McKinley’s last two prom queens were Rachel and Kurt. Tina wins anyway. (Probably owing to her campaign slogan: “Don’t be racist. Vote for Tina!”) Almost immediately after taking the stage for her coronation, Tina gets a massive bucket of Slushie dumped on her, Carrie-style, and runs out crying. Her king, Stoner Brett, looks stoically on, then gets knocked out by the bucket. Bree rejoices. 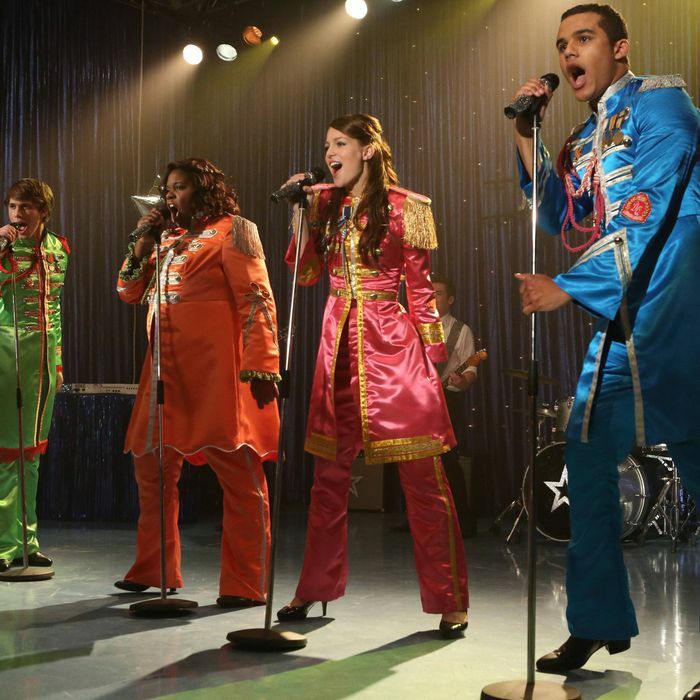 What follows is one of the more compassionate numbers Glee’s given us in recent episodes. Watching the other New Directions girls towel off Tina’s face and fix her hair and help her into a new dress is oddly powerful, as is the fact that they storm back into the gym as a cohesive unit. Sure, it’s helped by the fact that the entire scene is underscored by a stirring rendition of “Hey Jude,” but the impact of the scene isn’t entirely thanks to the song. It’s compelling because it truly does show the New Directions acting as a family; it’s an entirely united front to take care of one of their own. Mr. Schue has been preaching, “You guys are a family!” “You’re all you have!” since season one, episode one, but this is one of the first times we’ve actually seen that dynamic in play. It’s refreshing to see actual friendships forming and maintained, and it only took five years and two separate casts. Well done, Glee. Meanwhile, Sam and Santana are pussyfooting (sorry) their way into their first adult relationships. Santana’s never been with anyone other than Brittany (aside from a few college hookups), but she has her eye on Dani, who she assumes is a lesbian because she “wears so much eyeliner.” Dani’s adeptly played by Demi Lovato, but it’s an odd bit of stunt casting, since she’s already on The X Factor, which airs just before Glee on Fox. Still, she’s a charming girl, and of course she can sing. She’s got a nice chemistry going with Santana; it’ll be interesting to see where and how that builds beyond chaste kisses on stoops. Somewhere in all of this, Sue calls Mr. Schue “Busted Timberfake,” and it’s everything I never knew I always wanted. The episode ends with both the New Directions and the New Yorkers singing “Let It Be,” in flowy pastels on the McKinley stage and with Champagne in hand in the Bushwick loft. The performance captures all the diverse (and semi-contradictory) nuances of the song: hopeful, resigned, comforting, and celebratory. And it’s a good thing the episode closed on a note of calm and hopefulness, because based on the promo, next week’s episode promises to be gutting. I’m not ready.